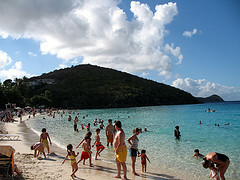 Magens Bay is probably the single most popular beach on St Thomas. Maybe the most popular beach in the entire Virgin Islands. There are plenty of reasons for that. For starters, it's certainly one of the most beautiful beaches anywhere in the Caribbean. For that matter, it's one of the finest beaches anywhere in the world. To begin with, its natural features are outstanding. You'll find a mile stretch of fine white sand backed by coconut palms and sea grape. The large bay is sheltered, and surrounded by lush green mountains that rise up from behind the beach. 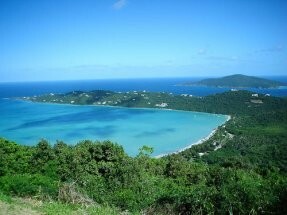 You'll find Magens Bay on the relatively quiet north shore of St Thomas, about three miles from town. The water is almost always calm, and it stays shallow a good way out, so if you have small children, this is a great beach for you to bring them to. But Magens doesn't just offer great physical features; it's also got some of the best amenities in the Virgin Islands. There are good changing rooms with showers and bathrooms. You'll find a lifeguard here every day. There's also a watersports center where you can rent paddle boats, kayaks, and sunfish. You can also rent snorkel gear and floats. You can even get your hair braided! If you get hungry, you can get burgers, sandwiches, pizza, and cold drinks at the on-site restaurant. And, if you want to pick up a little something for the folks back home, there's a gift shop at Magens beach, too! So, is there a downside to Magens Bay? For one thing, the snorkeling is better elsewhere. Also, the very fact that Magens is so popular means it can often be busy. If you're looking for a lonely, peaceful, isolated stretch of sand, Magens probably isn't it. Many of the hotels on St Thomas that don't have their own beaches send their guests to Magens. It's also the beach that many of the cruise ship passengers visit. And it's popular with residents, especially on weekends and holidays. At these times it can become just plain crowded, and loud, too. Of course, for some people, that busy party atmosphere just makes Magens all the more appealing. Whatever your preference, Magens Bay beach is certainly worth a visit... maybe a lot of visits! Note: this is the only beach on St Thomas that charges admission. It's $4 for adults ($2 for residents); children under 12 get in free.